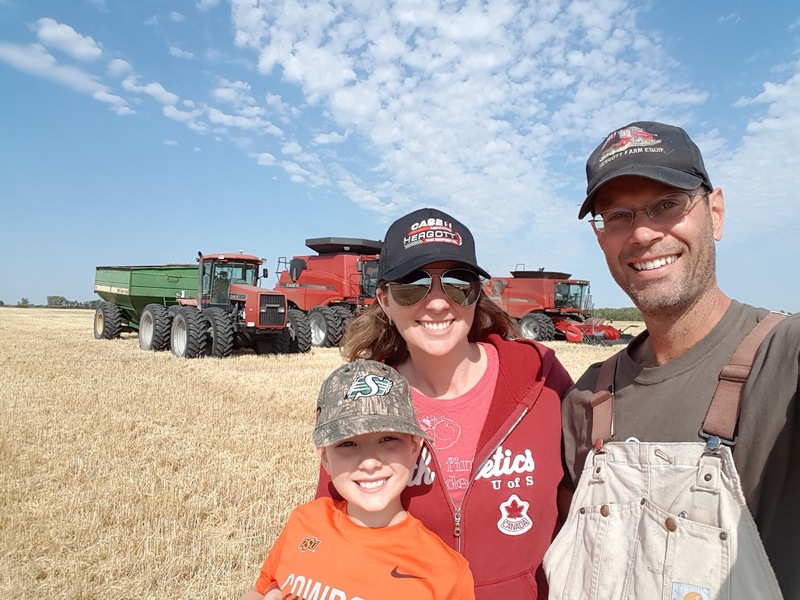 It is the final day of Agriculture Month in Saskatchewan, but I ask each of you to continue to share your food stories throughout the year. This is something that I am sure today’s guest post author, Clinton Monchuk, would agree with. You see, beyond farming, Clinton also heads another of my favourite organizations, Farm and Food Care Saskatchewan. This is an organization devoted to helping consumers navigate through the multitude of food options by bringing them one step closer to the farmers who produced the food, and bridging that gap. 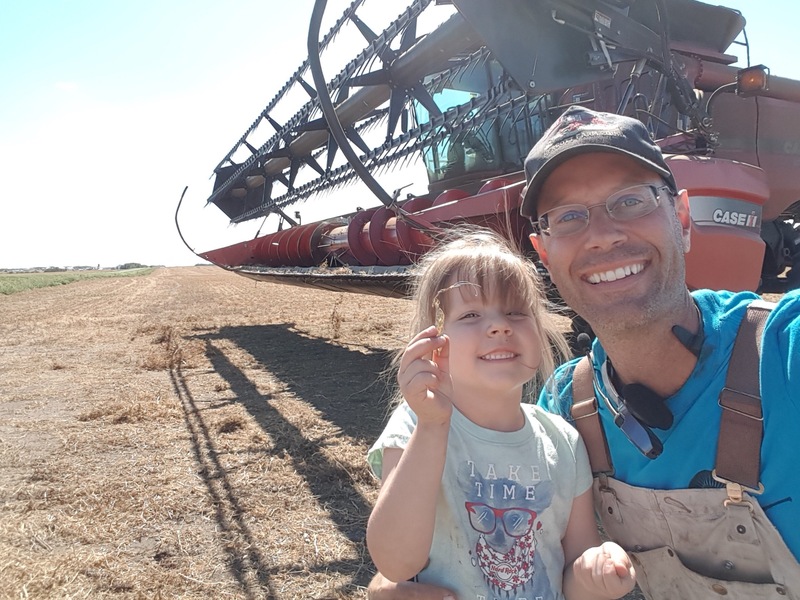 Follow Clinton on Twitter @cgmonch or Farm and Food Care SK @FarmFoodCareSK and visit their website here. When I consider the many blessings this beautiful country of Canada has provided for my family and me, I feel it would be short sighted to not remember our past and how my food story has been formed. Similar to many prairie beginnings, the story of me is also my food story.My food story started at the end of WW1 when a young prisoner of war, my grandfather, left Eastern Europe in his early 20s in search of a peaceful country where food would be abundant. Canada’s promise of “utopia” still included its challenges. Although there was a lot of land, much of it had to be cleared of trees and broke to be made suitable for farming. I try to picture myself and my family breaking land in scorching heat of our summers with the labour done by hand. It is hard for me to imagine producing food for my family and others under the same conditions that he would have done it. Yet, he raised a family on 160 acres, which is roughly what I can plant now in 5 hours. Sometimes we romanticize food production of the past and it’s simplicities but fail to recognize the difficulties. When there were crop failures from drought or early frost, the ability to support a farm family disappeared. This resulted in malnourishment, higher infant mortality rates and family members being more susceptible to disease. This concept is so far removed from our generation that it seems like a physical impossibility, yet it happened. One only has to read the book, The Grapes of Wrath by John Steinbeck to make an emotional connection to the hardships that occurred with farm families during this time. My father took over the farm when he was 17 years old, after my grandfather died suddenly of a heart attack. As a young man he could identify the need to move forward and expand as other smaller farms were already falling by the wayside. 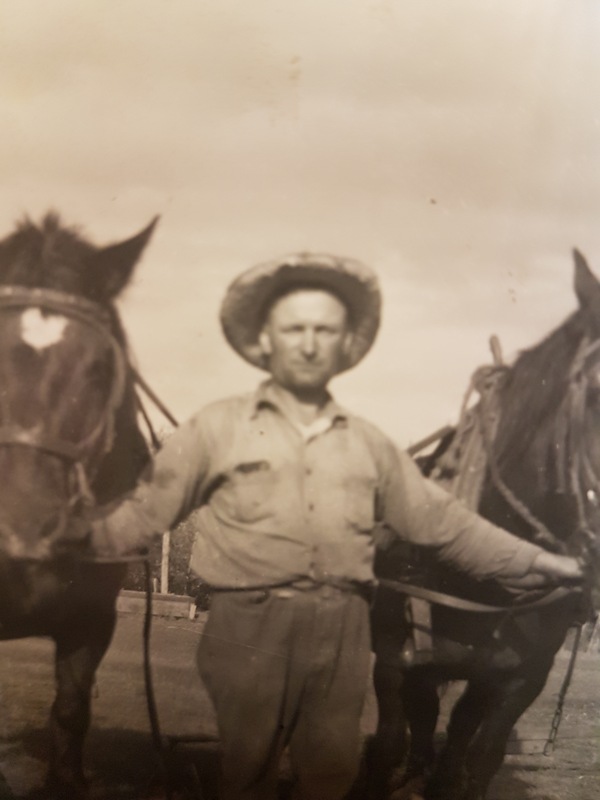 Through the years not only did he and my mother raise six children, but they also expanded their land base, built a large scale dairy operation, increased their beef herd and dabbled in selling fresh fruits and vegetables. I remember numerous times being late to sporting events and family suppers as a result of a cow calving, taking her well-being and the well-being of the calf over the importance of whatever we were to attend. I can also appreciate the progression of grain farming from cab-less tractors and combines, to the comforts of cabs. 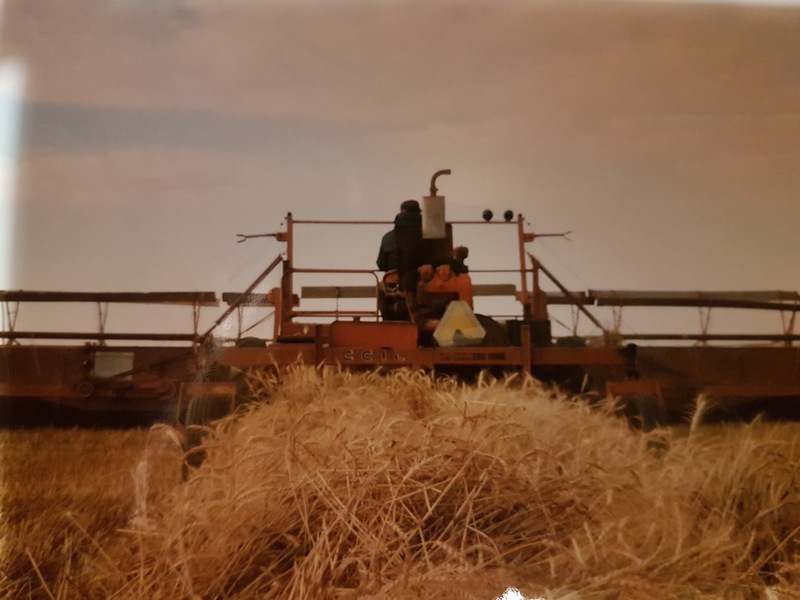 I still have phantom scratches as I combine malting barley thinking of how my father would have had that chaff blowing around his face. 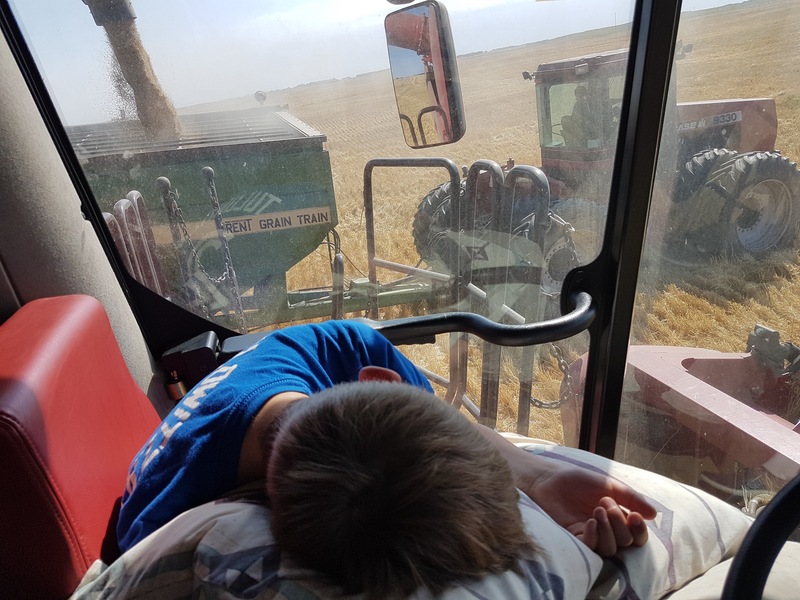 Growing up in agriculture allowed me to appreciate the sweat of the spring and summer, while reaping the rewards of harvest. The vegetable growing season was a busy time tending to the garden after the cows were milked by picking weeds and potatoes bugs, hoeing, hilling and the back-aching task of harvesting it all. But we also enjoyed all this fresh produce as a family. Some of my greatest memories of meal time are eating thick, juicy home-grown BBQ steaks with fresh potatoes smothered in cream and dill sauce, fresh lettuce picked an hour before supper, then topped off with fresh strawberries and cream with a touch of sugar. Hard to not read that and lick your lips! Fast forward to today and my food story continues. My brother and I are now in the process of taking over the family farm and our children and spouses are involved in the process. 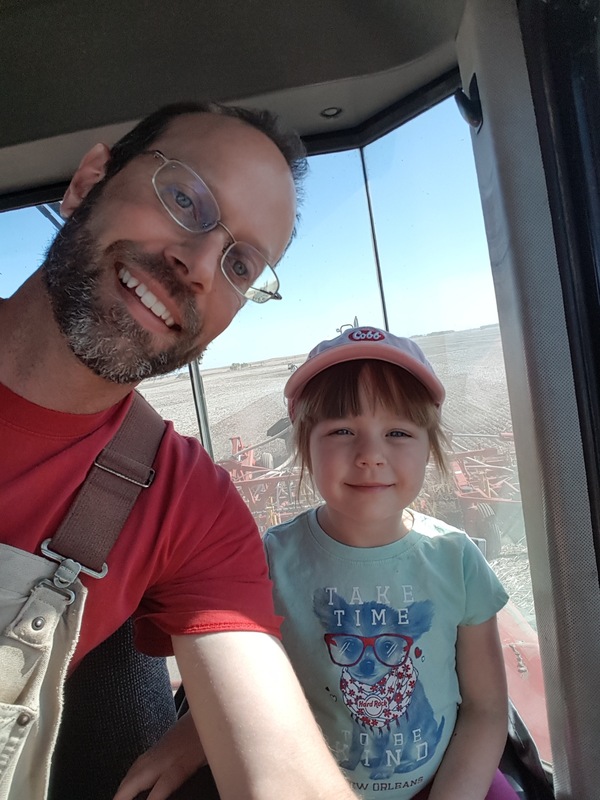 Our kids ride with us in the tractors and combines so they too can feel the appreciation of growing food. 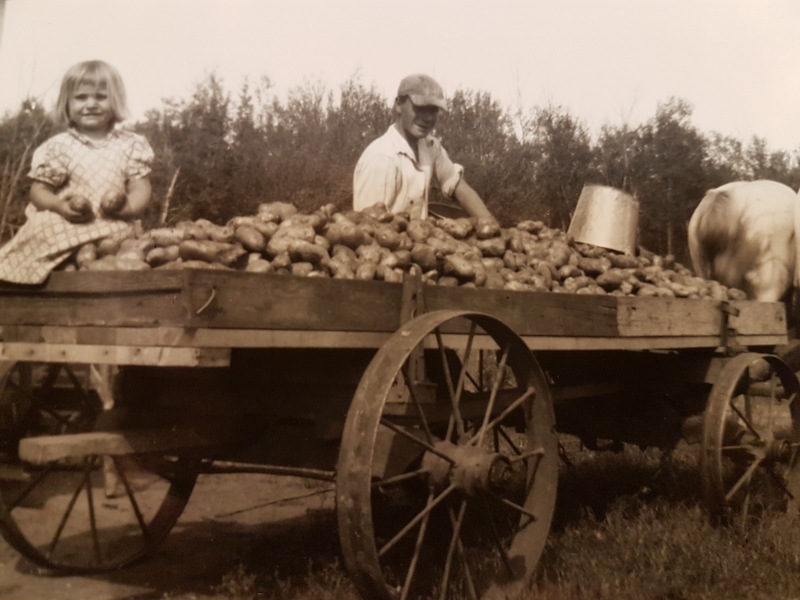 Gone are the days of cab-less tractors or combines, but producing food for our family and thousands of others is still in our blood. For me, my food story is the feeling of planting a crop, working with family, watching a calf being born, picking a fresh strawberry or smelling the settling dust during harvest, and it’s that feeling where I want my children’s food story to start.